Dr. Deming's Ideas Dr. Deming's famous 14 Points, originally presented in Out of the Crisis, serve as management guidelines. The points cultivate a fertile soil in which a more efficient workplace, higher profits, and increased productivity may grow. End the practice of awarding business on the basis of price tag alone; instead, try a long-term relationship based on established loyalty and trust. Work to constantly improve quality and productivity. Eliminate exhortations for the work force; instead, focus on the system and morale. (a) Eliminate work standard quotas for production. Substitute leadership methods for improvement. (b) Eliminate MBO. Avoid numerical goals. Alternatively, learn the capabilities of processes, and how to improve them. The first of the 14 Points charges management with establishing continual improvement through the redefinition of the company's purposes. Quite simply, the company must survive, compete well, and constantly replenish its resources for growth and improvement through innovation and research. In the fifth point, Dr. Deming states that only a commitment to a process of continual improvement truly rewards. A company cannot expect to ignite and feed a quality revolution from which it will prosper for all time. Instead, it must adopt an evolutionary philosophy; such a philosophy prevents stagnation and arms the company for the uncertain future. Part of the evolutionary mentality is to abandon practices that, despite their obvious short term benefits, ultimately detract from the company's effectiveness. Point number four specifically warns against this scenario: the purchasing department of a company consistently patronizes those vendors who offer the lowest prices. As a result, the company often purchases low quality equipment. Dr. Deming urges companies to establish loyal ties with suppliers of quality equipment. Point five condemns mass inspection procedures as inefficient; a product should be monitored by the workers, throughout the assembly process, to meet a series of quality standards. In the long term, the use of better equipment and a more intense worker-oriented method of inspection will markedly improve productivity and lower costs. In order to accomplish these goals, a company must develop a consistent, active plan that involves its entire labor force in the drive toward total quality. Cooperation- Dr. Deming based his new business philosophy on an ideal of cooperation. In order to fulfill its own potential, a company must harness the power of every worker in its employment; for that reason, the third point bars shoddy workmanship, poor service, and negative attitudes from the company. Theory of Profound Knowledge -- In order to promote cooperation, Deming espouses his Theory of Profound Knowledge. Profound knowledge involves expanded views and an understanding of the seemingly individual yet truly interdependent elements that compose the larger system, the company. 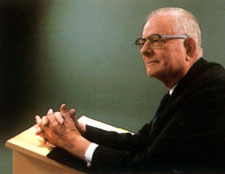 Deming believed that every worker has nearly unlimited potential if placed in an environment that adequately supports, educates, and nurtures senses of pride and responsibility; he stated that the majority--85 percent--of a worker's effectiveness is determined by his environment and only minimally by his own skill. employ an understanding of psychology--of groups and individuals. eliminate tools such as production quotas and sloganeering which only alienate workers from their supervisors and breed divisive competition between the workers themselves. form the company into a large team divided into sub-teams all working on different aspects of the same goal; barriers between departments often give rise conflicting objectives and create unnecessary competition. spread profit to workers as teams, not individuals. eliminate fear, envy, anger, and revenge from the workplace. employ sensible methods such as rigorous on-the-job training programs. In the resulting company, workers better understand their jobs--the specific tasks and techniques as well as their higher value; thus stimulated and empowered, they perform better. The expense pays for itself. Biography As the sun rose on the 20th century, a baby was born to the Deming family in a small town in Iowa. W. Edwards Deming would become a colossus of modern management thinking. He would live through most of the century, marking it with tremendous impact. The Demings moved from Iowa to Wyoming, and in 1917, Edwards entered the University of Wyoming in Cheyenne. To fund his education, he worked as a janitor. He graduated in 1921, and went on to the University of Colorado, where he received a M.S. in physics and mathematics. This led towards a doctorate in physics from Yale University. From physics, Dr. Deming gravitated towards statistics. The U.S. Census Bureau hired Dr. Deming in 1940, just at the time that the Bureau shifted its procedure from a complete count to a sampling method. Upon completion of the 1940 census, Deming began to introduce Statistical Quality Control into industrial operations. In 1941, he and two other experts began teaching Statistical Quality Control to inspectors and engineers. Dr. Deming started his own private practice in 1946, after his departure from the Census Bureau. For more than forty years his firm served its various clientele--manufacturers, telephone companies, railways, trucking companies, census takers, hospitals, governments, and research organizations. As a professor emeritus, Dr. Deming conducted classes on sampling and quality control at New York University. For over ten years, his four-day seminars reached 10, 000 people per year. The teachings of Dr. Deming affected a quality revolution of gargantuan significance on American manufacturers and consumers. Through his ideas, product quality improved and, thus, popular satisfaction. His influential work in Japan--instructing top executives and engineers in quality management--heralded that nation's economic rise. Dr. Deming contributed directly to Japan's phenomenal export-led growth and its current technological leadership in automobiles, shipbuilding and electronics. The Union of Japanese Science and Engineering (JUSE) saluted their teacher with the institution of the annual Deming Prizes for significant achievement in product quality and dependability. In 1960, the Emperor of Japan bestowed on Dr. Deming the Second Order Medal of the Sacred Treasure. Stateside, the American Society for Quality Control awarded him the Shewhart Medal in 1956. In 1983, Dr. Deming received the Samuel S. Wilks Award from the American Statistical Association and election to the National Academy of Engineering. President Reagan honored him with the National Medal of Technology in 1987, and, in 1988, the National Academy of Sciences lauded him with the Distinguished Career in Science award. He was inducted into the Automotive Hall of Fame in 1991. Dr. Deming was a member of the International Statistical Institute. He was elected in 1986 to the Science and Technology Hall of Fame in Dayton. From the University of Wyoming, Rivier College, the University of Maryland, Ohio State University, Clarkson College of Technology, Miami University, George Washington University, the University of Colorado, Fordham University, the University of Alabama, Oregon State University, the American University, the University of South Carolina, Yale University, Harvard University, Cleary College, and Shenandoah University, Dr. Deming received the degrees L.L.D. and Sc.D. honorius causa. From Yale University, he won the Wilbur Lucius Cross Medal, and the Madeleine of Jesus from Rivier College. Dr. Deming authored several books and 171 papers. His books, Out of the Crisis (MIT/CAES, 1986) and The New Economics (MIT/CAES, 1994) have been translated into several languages. Myriad books, films, and videotapes profile his life, his philosophy, and the successful application of his worldwide teachings.